What do your kids eat for breakfast, lunch, and dinner? 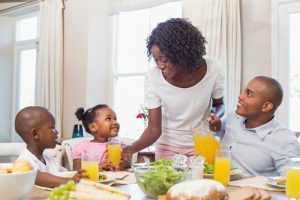 We’re not going to insist that your children learn to love kale, gobble down chia seeds, or enjoy a green smoothie for breakfast, but we are going to talk about three simple changes you can make to the way your family eats that will allow your children to eat many of the foods they love, but in a healthier way. Sure, your kids love their favorite chain restaurant. They love the gigantic portions, the refillable drinks, and the absolutely enormous desserts. You may love those portions too, but restaurants are setting a bad example by offering up portions that simply exceed the amount of fat, calories, and sugar a person needs in one meal. Food manufacturers aren’t doing us any favors, either. Serving sizes on typical packages of food are far larger than is appropriate. It has become increasingly difficult for Americans to understand what their portion sizes should be, when larger than life portions have become the norm. In fact, pediatrician and childhood obesity expert Sarah Hampl says that your child’s hand holds the key to kid size portion control. 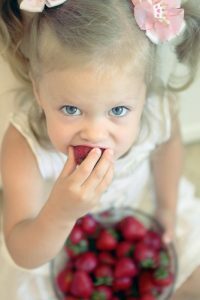 Children should be eating servings of fruit and veggies the size of their fists. The same goes for whole grains. Servings of meat should be a bit smaller, and should fit into your child’s palm. Cheese should be about thumb-size. You’re likely sending your kids food to daycare or preschool in plastic containers. Keep those containers small, and keep plate sizes small at home, as well. Portions won’t seem as small when served in a scaled down context. Chances are that your children love apples, pears, peaches, nectarines, and other fruits. They also probably eat their fair share of chicken, fish, and other meats. Produce, meat, poultry, and fish are all available as organic products, and choosing organic foods can have a real effect on your children’s health. Organic foods have not been treated by insecticides, artificial fertilizers, GMOs, or radiation. 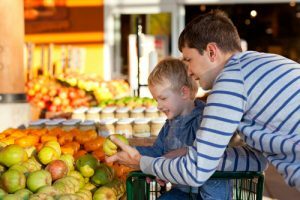 Because the value of an organic diet has become so compelling, many families are choosing to feed their children organic products, despite the fact that their grocery bill might see a slight uptick. This poll conducted by the Organic Trade Association shows that American families are starting to see the benefits of organic foods and are willing to prioritize healthy choices. Toxic insecticides found in inorganic foods leave their trace when ingested. Children who do not eat organic have higher levels of metabolites from these insecticides in their bodies than children who eat organic food. Because these pesticides are thought to be carcinogens, and may upset the body’s hormone balance, organic food has become more popular among families who see it as a safer choice. Pesticides sprayed on fruits and veggies are not the only inorganic substance you may want to avoid. Animals raised organically not have been fed antibiotics, and eating organic meat limits your kids’ potential exposure to those antibiotics. There are ways to eat an organic diet that won’t impact your wallet. Many towns offer weekly farmer’s markets. Fresh, organic produce, grown locally, can be purchased for a fraction of the amount you might pay at the grocery store. Plus, buying seasonal produce cuts down on cost, and has less environmental impact than buying foods that have been flown from other climates. Check with your local farms to see if they offer a CSA package that might offer a variety of organic produce at a low cost. If you’re interested in eating organic foods, it only makes sense to talk about clean, whole foods as well. What’s a whole food? It’s a food that, when it gets to your table, is similar to its form when found in nature. An apple is a whole food, because it comes to your kitchen in the same form as when it sits on the tree, but an apple fruit roll-up is not a whole food, since it has been processed and refined. It may lack the peel , which contains fiber and nutrients, and it may contain added sugar, preservatives, and additives. An apple retains all of its original nutrients, and is far healthier. Similarly, when you buy rice, look for brown rice instead of white. Brown rice has retained its original form, with its hull and bran intact. The hull and bran contain fiber, protein, and nutrients. White rice has been stripped of its hull and bran. It’s been processed and has had some of its nutrients reduced as a result. When you’re buying foods at the grocery store, look for whole items, like fruits and veggies in their original form. Look for meat, fish, and poultry that looks like it comes from the butcher counter and not like a fast food item. Buy bread that is made up of whole grains, and grains that are whole. Read labels. If there is a long list of ingredients, many of which are hard to pronounce, you may not be looking at a whole food. These three changes can also serve as a great opportunity to teach your kids where food comes from, how nutrients affect their bodies, and how to choose the right foods. These health lessons will stick with them as they grow!